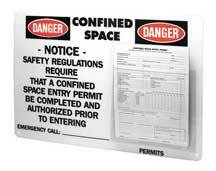 Safety Emporium carries signage and other items to help comply with OSHA confined space entry requirements. Air is the mixture of gases that surrounds the Earth. The composition of the earth's atmosphere varies with altitude, but at sea level contains approximately 78% nitrogen and 21% oxygen by volume. An oxygen-deficient atmosphere contains less than 19.5% oxygen by volume. An oxygen-enriched atmosphere contains more than 23.5% oxygen by volume. An atmosphere that is immediately dangerous to life or health (IDLH) poses an immediate threat to life, would cause, irreversible adverse health effects, or would impair an individual's ability to escape from a dangerous atmosphere. Standard atmospheric pressure is defined as one atmosphere = 14.7 pounds per square inch (psi) = 760 torr. A list of pressure units and an on-line conversion calculator is available on this site. Cylinders of compressed air are often used in industrial settings and laboratories. Be certain you are familiar with cylinder and compressed gas safety, including the proper use of gas regulators. Oxygen-enriched atmospheres present exceptionally dangerous fire hazards (see link below). Oxygen-deficient atmospheres may result in unconsciousness, coma or death (see link below). Air-purifying respirators or other breathing devices may be specified for use with the chemical or by emergency responders. Pyrophoric chemicals spontaneously inflame in air. Flammable or explosive limits are defined using a percent volume in air. In cases of inhalation of a hazardous chemical, the victim should be removed to fresh air. Special engineering controls such as fume hoods or local exhaust ventilation may be indicated. In addition, many chemicals have high vapor pressures, which can result in an oxygen-deficient atmosphere, a flammable atmosphere, or narcosis. Never store cylinders of air or oxygen with flammable materials or gases. Pure oxygen presents many risks of fire, explosions, injuries and death. See Fire Hazards of Oxygen and Oxygen-Enriched Atmospheres by the Asia Industrial Gases Association. A good collection of gas cylinder safety at Oklahoma State U. 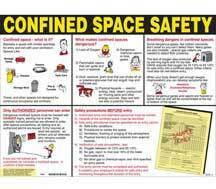 Gas Cylinder Safety Guidelines at Iowa State U (92K PDF download). See also: Asphyxiant, pressure units, ventilation.